Halloween in St. Louis doesn't have to be too scary. There are plenty of fun and safe events for kids and the whole family—beyond the traditional trick or treating. You can visit a pumpkin patch, explore a corn maze, join a haunted hayride, and more. Wandering around a cornfield after dark can be a little scary, but it's pure fun at the Great Godfrey Maze. The giant maze is cut into seven acres of cornfield. The maze is open during the day, but bring a flashlight and try the Haunted Maze at night. The Haunted Maze is open Fridays, Saturdays, and Sundays in October. Tickets are $6 for adults and $4 for children. Kids under five get in free. When you're trying to find the perfect pumpkin, look no further than Eckert's Orchards. Its pumpkin patch has any size pumpkin you'd want, including ones that weigh up to 150 pounds. During weekends in October, Eckert's is hosting its Jumpin' Pumpkin Jamboree with wagon rides, live music, pony rides, a petting farm, funnel cakes and more. The Millstadt location also offers Haunted Hayrides through the orchard each Friday and Saturday in October. Grant's Farm is a popular place to celebrate Halloween in St. Louis. It all begins with a tram ride in the dark to the center of the park with ghosts and goblins lighting the way. There's also food, carousel rides, and pumpkin decorating. The celebration runs from 6 p.m. to 9 p.m. Admission is free, but parking is $20 per car. Celebrate Halloween at the Party in the Patch at Shaw Park in Clayton. The evening of fun includes hayrides, carnival games, and treats. Admission for children is $7 in advance and $10 at the event. Parents get in free. The party runs from 6 p.m. to 8:30 p.m.
Halloween Frenzy is a celebration for children ages 4 to 10 at the St. Louis Carousel at Faust Park. The festivities run from 10:30 a.m. to noon. They include games, treats and, of course, carousel rides. The cost to attend is $10 per child. Another great Halloween event for children is Boo at the Zoo Nights. The St. Louis Zoo is open late, starting October 18, for kid-friendly Halloween fun. Then, there's the Zoo's "Spooky Saturday" party on October 29, where children of all ages can trick-or-treat along the Zoo's Pumpkin Trail and join in a costume parade. Admission to Boo at the Zoo Nights is $6 for members and $7 for non-members. Children younger than two get in free. There is also free parking available on the South Lot. St. Louis has many Halloween activities for the kids but one of the best is the Not-So-Haunted House at the Magic House. Every kid gets their own autograph book, and as they trick or treat through the house, they can collect signatures from many of their favorite storybook characters. Past characters have included favorites from Peter Pan, Harry Potter, and Alice in Wonderland. Admission is $10. Halloween at Purina Farms includes pumpkin painting, costume contests, puppet shows, and trick-or-treating in the barn hayloft. The fun runs Friday and Saturday from 4:30 p.m. to 7:30 p.m., and Sunday from 2:30 p.m. to 5:30 p.m. Admission is free. Parking is $5 per car or $20 per bus. Where better to hear ghost stories than at the 200 year old Daniel Boone Home in St. Charles County? Storytellers wander the grounds of the old home telling true stories of ghosts, goblins and things that go bump in the night. This is designed to be a kid friendly event, but may be a little scary for very young children. Admission is $10 for adults and $6 for children. Kids can attend a "Booterflies" Halloween party at the Butterfly House in Faust Park. The not-so-scary event is a fun way to enjoy the holiday. There are games, crafts and special treats for kids. The party runs from 5 p.m. to 7 p.m. Admission is $14 a person. Members get a $2 discount. You won't feel so guilty about eating all of that Halloween candy if you participate in the annual GO! St. Louis Halloween Half Marathon, 10K, 5K and Fun Run. Runners and walkers of all ages are encouraged to wear costumes and enjoy the spooky course through St. Louis. There's also a costume contest for race participants. To register, check out the GO! St. Louis website. The St. Louis Science Center is hosting a ghoulish good time for kids during its Science Spooktacular. The evening includes spooky science demonstrations, slimy hands-on experiments, and showings of family-friendly movies in the OMNIMAX Theater. Science Spooktacular runs from 5 p.m. to 8 p.m. Most activities are free. Children are invited to trick-or-treat at businesses in downtown Kirkwood from 5-7 p.m. Several dozen businesses will be handing out treats to kids in costume the Thursday before Halloween. Spend the afternoon carving pumpkins at Suson Park in South St. Louis County. A park ranger will be on hand to help with the designs. Pumpkins and carving tools are provided. Advanced registration is required. The cost to participate is $10 per child. The Missouri Botanical Garden offers a special Halloween event for Garden members. Kids can enjoy an afternoon of trick-or-treating and Halloween fun. Children can follow a map to different treat stations where costumed characters hand out goodies. Admission to Ghouls in the Garden is $5 for children ages three to 12. Adults are included with regular Garden admission. For a safe afternoon of trick-or-treating, bring your children to historic Main Street in St. Charles. Local businesses will be handing out candy to kids ages 12 and younger from 3 p.m. to 5 p.m., on Halloween. Spend Halloween afternoon with friendly ghosts and goblins at the Halloween Hoopla in St. Charles. The free party for kids ages 3-12 and their families is sponsored by the St. Charles Parks Department. The event is from 3 p.m. to 5 p.m., at Frontier Park. St. Louis County is hosting a Halloween Boo-nanza for children at the North County Recreation Complex from 6 p.m. to 8 p.m., on Halloween. The free event includes hayrides, a scavenger hunt, costume contest and pumpkin decorating. The small town of Alton, Illinois, celebrates Halloween in a big way. Each October 31, the town hosts a Halloween parade with floats, costumed characters, marching bands and more. The marchers pass out candy and treats to children lining the parade route. The parade steps off at 7:30 p.m., at Broadway and Washington. The residents of the 5300 block of Nottingham Avenue in South St. Louis really know how to throw a Halloween Party. 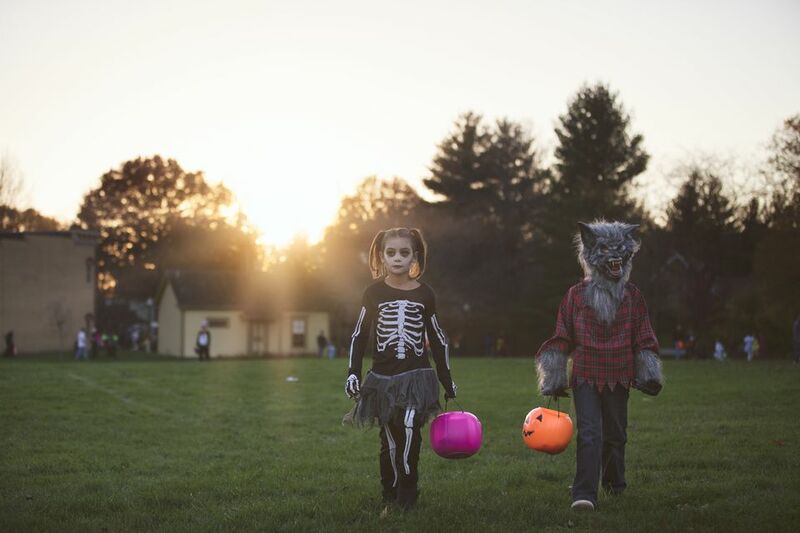 Each year they deck out their homes and pass out candy to thousands of kids and parents who descend on the Southampton neighborhood on Halloween night. The party on Trick or Treat Street runs from 5:30 p.m. to 9 p.m.